Pound Puppies measure approx.13" long x 4" tall. Be sure and have a look at my other pound puppies. 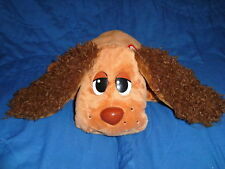 Dated 2007 Paw Prints Group, Inc. A Plush with beanies in the four paws. Tush tag is attached his plastic eyes have a droopy look. Be sure and have a look at my other pound puppies. Pound Puppy from the nose to end of tail he measure approx. 8" long x 2.5" tall. Lot of 11, 9 puppies and 2 kitties. A few have worn eye paint (see pics). White cats whiskers are curled on one side. One puppy has a very small hole starting on his back (see pic). Pound Puppies Mini Folding Wedding Honeymoon Eiffel Tower Playset. Condition is Used. Shipped with USPS Priority Mail. No puppies included. Condition is Used. Looks Great. Well Cared For. There are two gray cats, one is marked cap toys. The lion is Animal Alley. Light brown with black spots, c. 1986 Tonka. In EXCELLENT condition. Nice and soft and velvety. RARE VINTAGE 1996 POUND PUPPIES PUREBREDS CHOW FAMILY GALOOB NEW SEALED ! We would be very happy to help out and discuss any concern you may have! All Different Markings including Solid Brown, Gray with Brown Spots and White with Black Spots. Excellent pre-owned condition. All Different Markings including Solid Black, Gray with Brown Spots and White with Black Spots. All Puppies have Collars. Excellent pre-owned condition. Vintage 1986 Tonka Mom with Baby Pound Puppy Brown&Black w/ Box Papers Collar. Condition is New. Shipped with USPS Priority Mail. Excellent to near mint condition. This is in immaculate shape all around. 33 year old toy. Acquired from an estate sale and home appeared to be pet and smoke free. No signs or smell to suggest otherwise. Collar,puppy and original paperwork are all included. You can find many pound puppies on eBay for a fraction of the price. All are loose and out of box. These are becoming rare and hard to find in this condition. Must have for any collection. Jacket is in used condition. Colors look bright. Zipper works. Pull strings on hood are intact. One of the pull strings on the bottom is a bit frayed. Size 4T. The item pictured is the exact item you will receive. Please use pictures for condition references. Please ask all questions before bidding or buying. International shipping available. I do combine shipping. PayPal only. Smoke free home. Payment required within 48 hours of auction's end. Huge Lot of Vintage Pound Puppy Miniature Playsets With Figures Animals. Condition is Used. A nicely kept collection. Please refer to pics for details and what’s included and any wear from use (sticker wear, marks ect..). Type of toy: Plush. ------------------------------- cute plush shows gentle wear from play. it is missing the collar. Year of manufacture: 1985. I treat others the way I want to be treated. Communication is vital, as is honesty and integrity. VTG Tonka 1985 Brown Pound Puppies Puppy + Outfits Plush Stuffed Animal Toy 18"
Vintage Large Pound Puppy Puppies 18" Brown Tonka Toys 1985 No Collar Nice. Condition is Used. Vintage Large Brown Pound Puppy by Tonka made back in 1985. No collar. 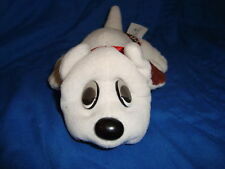 The item is in very good condition Check out our other vintage Pound Puppy items. We combine shipping and ship worldwide using ebays global shipping program. Winner within the US to pay $8.95 shipping via USPS mail with tracking number. Thanks for viewing our listing. This is the feeding bowl from the care set. This is dated 1986 by Tonka. This is in good used condition. There is a little run-off/scuffs. This would be a great addition to your collection or perfect for your little one! Pound Kitty. Condition is Used. Shipped with USPS Priority Mail. Tape seal is still intact. Sour Grapes and the Purple Pieman are in excellent condition. Light brown, dark brown and black. these are in good clean condition. Overall it is in FINE shape considering its age and it has been played with before. Vintage Pound Puppies Plush Gray Dog w/spots & Red Collar Galoob . Condition is Used. Shipped with USPS First Class Package. No holes or stains and comes from a smoke free home. 1986 Lovable Huggable 13" Brown Pound Puppy Plush from Tonka! Pound Puppies are stuffed toy animals that originated in the 1980s. 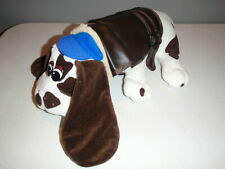 The plush dogs had droopy eyes and oversized floppy ears. The Pound Puppies franchise included the stuffed dogs, a line of stuffed cats called the Pound Pur-r-ries, a television series, books, and movies. Who made the original Pound Puppies? Tonka brought the Pound Puppies to the U.S. market in the 1980s. "Loveable Huggable" was the tagline for the original stuffed animals. While the line was discontinued in the early 2000s, a new television series of the same name was introduced in 2010, along with a line of new toys, from different companies. What was the original idea behind Pound Puppies? The plush toys debuted in 1984. The target audience for the Pound Puppies was children who wanted a pet to nurture and care for. Children could adopt a stuffed pet without the customary care and cost that would come with a live pet. A special mock care guide came with each puppy. It was recommended to walk the puppies for exercise and to bathe them regularly. They were machine washable. The puppies even came with all their shots, similar to puppy vaccinations, before they were brought home from the store. Who are the characters from the Pound Puppies? Lucky: As a scruffy mutt, he's the main protagonist of the Pound Puppies world. He's known for being a smart, well-adjusted pup. Cookie: This streetwise boxer is Lucky's love interest. Despite the mutual affection between Cookie and Lucky, they always get interrupted before they can proclaim their love for each other. Niblet: As a clumsy sheepdog, Niblet is often a source of comic relief. He is a well-meaning dog with a love for peanut butter. Strudel: This German Dachshund is a genius inventor who creates many of the machines used by the Pound Puppies. While Strudel may be a small dog, he has a big ego. What are the educational benefits of Pound Puppies? Aside from the encouragement to care for and nurture Pound Puppies, similar to a real pet, the story of the puppies is one of friendship, compassion, and the bond between animals and their human friends. There is a variety of breeds and colours. In addition, in the animated movies and series, there are varying personalities of the different puppy characters. Content provided for informational purposes only. eBay is not affiliated with or endorsed by Pound Puppies.